Presumably in India, this smooth road which spans miles brings out the lost biker ... DONT ... just dont try this esp. if you are on a bike which does not have disk break. It is one of the most dangerous thing to do, as one ascending the smooth road to a dead end which ends in cracks and muddy road . Well , had to use all three available brakes on my Discover to stop ... one hand , one rear and third , my both legs. Lets look at the pic below ... lush mountains , vast fields and road of the city. This is Bangalore , believe me. And we are in heavens , the outskirts , and i still feel the tourism in the city is still underexplored but I would like it to be this way for a long time. This is me and Ajit at the dead end of this marvellous road, which is neither Nice Road , nor Outer Ring Road or Expressway or Superway . This is possibly some hidden place for bike drag race since the road just has tributaries to it , and it itself does not has a source or destination. An awsome place, but am sure i wont be able to find it again without the other two. Its a month later i am posting this. And i have wanted to do this for so long now. The blog entry describes the first weekend of August celebrated in a special way. 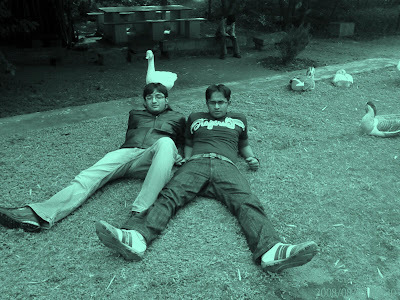 The weekend is also known as Friendship Day. Even though I did not got a call from a few I had expected the most, the fun and space I shared with the other two guys will not be any less. 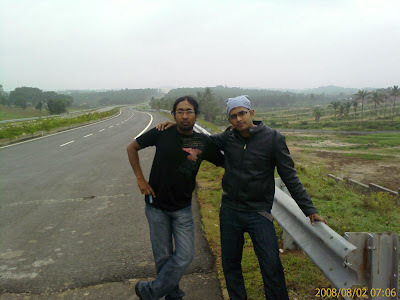 So It was 1st Aug2008 , and we decided to go to Mysore. Meeting Agenda : What to do on Weekend !!! Decided : Travel to Mysore Next morning, will ask few girls to move with us. So as decided , a few girls were called at 12:30 AM and requested them to come to Mysore, next day at 4:00 AM. This was what was expected to be more of unrealistic situation , and we were suitably awarded with curses , as the call to many went upto 1 AM. I specified , if there are no girls, i dont care and we are gonna have the fun. Forgot to mention , Ajit and Himanshu were in office and me in home. And i went to sleep at 1AM. Day: Aug 2 , 2008. The knock on the door , and Himanshu was unable to find the keys. Today only he was to forget the keys. He came in and informed me if the plan to go to Mysore is still ON. I was in half sleep, and yes Yes. And he asked me to get ready to leave. I was under impression that we will leave at 6 AM. This was not going to happen. I humbly , like a kid of four fought that I should be allowed to sleep for some time ,to which he refused. Ajit's call came , he will be home by 4:10 AM. and the wish was granted. I still cherish those 20 min of sleep. And i was waken by another shout from another one. And by 430 AM , without a plan , without girls even , these guys have decided to hit the road. So Himanshu has a bike but no helmet , so what to do now. We decided that he will carry on with Ajit and i will be drive alone. Anyhow I dont like guys sitting on my bike either. Also was decided we will go to Cafe Codee Day ( CCD) on Bangalore Mysore Highway. Now we are zig zagging the city roads. The virtually jam packed roads of BTM and Jaynagar were astonishingly empty. One would stop for a moment to wonder that this place can be real heaven , if the traffic is managed. The roads seem to be prefect till the time we crossed Jaynagar Petrol bunk, only to realise that the dream of perfect city was short lived. In the middle of a crossing , an entire place was dug and we took an alternate route. Another alternate followed, and this went on till the time we were actually convinced we are going to explore new territories. We ended up in Banshankari and then realised Ajit's bike is low on gasoline. Search for the bunk started as SOS. Finally we went on same known unknown path to reach to destination. One cut and one direction , to the north. Climbing steep ascents , and descending broken roads in the arms of a beautiful city. Yes , if you think Bangalore is all about traffic jams , IT companies and tall building , upcoming masterpieces and talent in India , other than a city with no nightlife and virtually non existent scenic beauty. You are mistaken my friend. 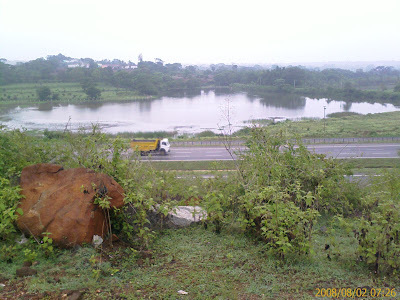 The outskirts of city will shower hills on either side. The morning breeze rinses the soul as no one does. The crystal clear sky , and the whole city to look out for , this was the place. All of us parked the bikes on site (not to be read onsite ) took a few pics and moved on. 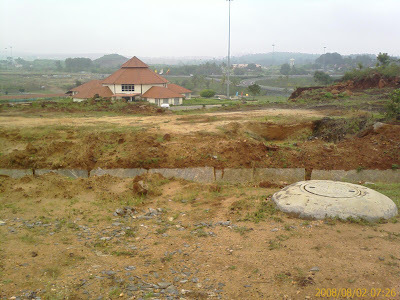 The target of Mysore CCD was lost in vast free lands, large farms and small small houses. Not soon we passed Mysore - Bangalore Road , and decided to find an alternate path.